Organza ribbon shoelaces were the first style of shoelaces I offered on Etsy. With some narrow crimp-on ends and little paddle dangles, one afternoon I decided to convert my excess stash of organza ribbon into shoelaces. The idea came to me completely on a whim, and I could see my husband thinking “here she goes again” as I sat on the floor cutting strands of organza and adding the tiny tips. The wider styles have been very popular with brides. There is quite a trend to go the comfy route on wedding shoes these days (especially on those long dresses where no one can see your shoes anyway), so I get a ton of requests from brides who go with blinged-out Converse instead of dressy heels. How much fun is that?!?! As my first style of shoelaces, it made sense to highlight my organza first and give a big “THANK YOU” to all of my customers who made me realize how much fun they are to make and got me rolling with Lost in Lace. This entry was posted in Shoelace Highlights and tagged All About Shoelaces, Lost in Lace, Organza Shoelaces, Ribbon Shoelaces. 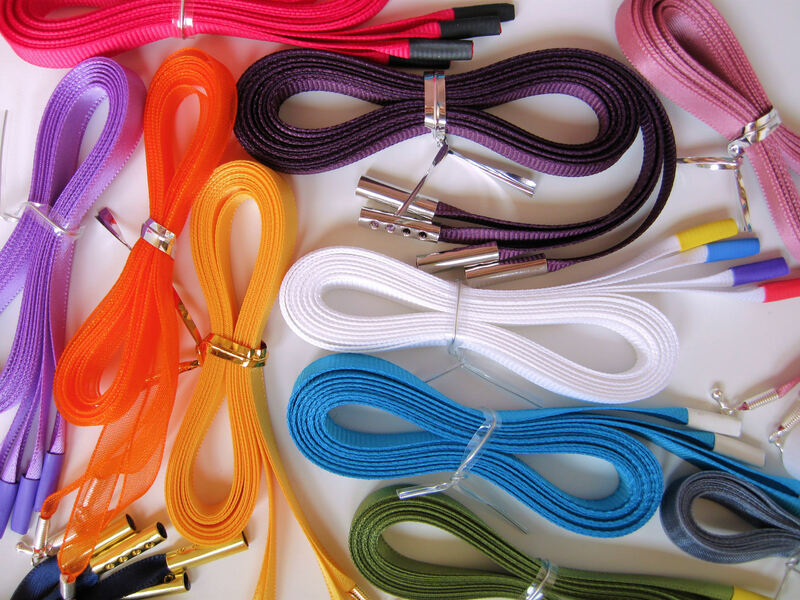 Part of the fun of designing your own ribbon shoelaces online is choosing the tips. When selecting the tips for your shoelaces, look for a style that will best accentuate the look you want as well as provide the functionality your shoes require to lace through their eyelets easily. The shops that belong to this blog offer a combination of plastic tips, metal tips and even a trim and seal option for certain types of ribbon. Plastic tips are heat sealed and glued in place to provide an easy way to lace shoes as well as protect the ends from fraying. They are form-fitting, so they adhere to the shape and texture of the ribbon underneath. For example, plastic tips on grosgrain shoelaces have those grosgrain ridges peaking through. Plastic tips can be very narrow when applied to narrow thin ribbons such as 1/4″ organza, and they can be quite wide when applied to wider bulky ribbons such as 7/8″ satin. While clear plastic tips are by far the favorite choice of my customers, plastic tips do come in a full range of opaque colors as well – Red, Orange, Yellow, Green, Blue, Purple, Gray, Black, White and Brown. Colored tips can be used to add a nice custom touch to basic shoelaces such as putting black tips on black shoelaces, or they can bring out an accent color in shoelaces with multiple colors. They can even be mixed and matched in a Rainbow effect with a different color on each tip such as a Red, Yellow, Blue and Green combination. Metal tips include wide crimp tips, long dangling tips and short dangling tips. All metal tips are available in either gold or silver colors. Dangling tips are finished with a very narrow crimp with a loop on the end to add either a long (1″) dangling paddle tip or a short (3mm) dangling teardrop tip. The narrow crimps are often narrower than plastic tips when used on wider ribbons, although they don’t fit onto the really wide shoelaces such as 7/8″ satin or grosgrain. I specifically do not advise using the long dangling paddle tips for babies or toddlers, since they may pose a choking hazard. Wide crimp tips are probably my favorite way to finish off a pair of shoelaces. Unfortunately at 3.5mm wide, they don’t fit through some eyelets. Women’s shoes can have very narrow eyelets (even just simple holes punched through leather), so I always recommend taking a close look at a shoe’s eyelets before adding the wide crimps. Whenever they fit though, I definitely think they are the way to go! Speaking of narrow eyelets, trim and seal tips are the best way to get ribbon shoelaces through any extremely tiny holes. Trim and seal tips are simply trimmed at an angle or in a forked shape, and then the raw edges are melted to resist fraying. For anyone who has their own ribbon on hand, trim and seal tips are also a fun DIY shoelace project. Trim and seal works best for heavier and solid ribbons such as grosgrain and satin. Thin and fragile ribbons, such as organza, simply don’t seal well and are inclined to fray anyway. This entry was posted in FAQ Topics and tagged All About Shoelaces, Lost in Lace, Ribbon Shoelaces, Shoelace Tips, Shoelaces.